Seville is the capital of Andalucia, Spain’s fourth-largest city, and the cultural and financial center of southern Spain. It is home to a UNESCO World Heritage Site that covers three landmark buildings from Spain’s Golden Age: its Cathedral, Alcázar and Archivo de Indias. Seville is also known for its diverse festivals and thriving nightlife scene. The city has long acted as a sea-port for commerce of agricultural goods produced farther west. Intense trade began in the area from Roman times, continued under Muslim rule, and exploded as Seville monopolized the new trade with the Americas. In the 19th century Seville gained a reputation for its architecture and culture and was a stop along the Romantic “Grand Tour” of Europe. It is home to a UNESCO World Heritage Site that covers three landmark buildings from Spain’s Golden Age: its Cathedral, Alcázar and Archivo de Indias. These are the vestiges of Islamic culture, centuries of ecclesiastical power, royal sovereignty and the trading power that Spain acquired through its colonies. Seville is also known for its diverse festivals and thriving nightlife scene. Apartamento Barrio Santa Cruz offers accommodation in Seville, 600 metres from Plaza Nueva and 1.1 km from Triana Bridge - Isabel II Bridge. The air-conditioned unit is 1.3 km from Plaza de Armas. Average score from 11 guest reviews: 8.7/10. 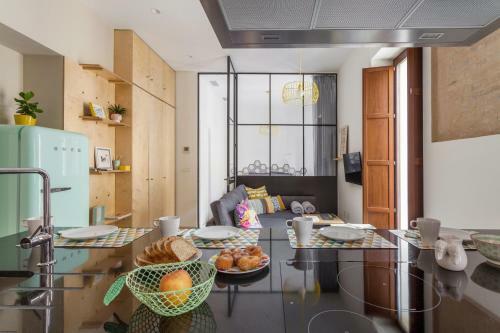 Situated 800 metres from Triana Bridge - Isabel II Bridge in Seville, this air-conditioned apartment features a terrace and a garden with an outdoor pool and a barbecue. The apartment is 900 metres from Plaza Nueva. Average score from 251 guest reviews: 8.3/10. Apartamento Metropol Parasol offers accommodation in Seville, 600 metres from Plaza Nueva. Guests benefit from terrace. Free WiFi is featured throughout the property. The kitchen is equipped with an oven and a microwave. Average score from 9 guest reviews: 8.5/10. Featuring free WiFi throughout the property, Casa Natalia Sevilla is a holiday home set in Seville, 800 metres from Plaza Nueva. It provides private parking. There is a seating area and a kitchen equipped with a dishwasher. Average score from 390 guest reviews: 9.1/10. 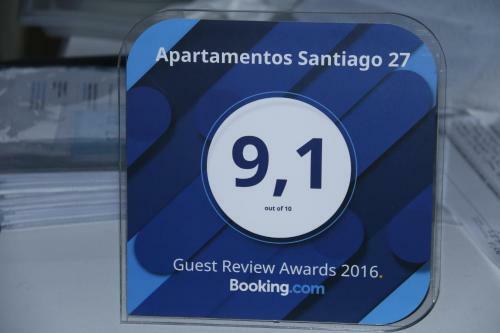 Featuring free WiFi, Apartamentos Santiago 27 offers accommodation in Seville. Plaza Nueva is 900 metres away. Some units are air conditioned and include a seating and/or dining area. Average score from 43 guest reviews: 9.1/10. The courtyard setting was so perfect and the apartment had everything you could need. The historic setting in a 16th century corral,full of young bohemian visitors and residence.The apartment was clean, the bed comfortable, information dossier helpful. We couldn't turn on the stove at first, but Ana answered our call and solved it immediately. Great apartment inside an old historical building, with a nice yard and atmosphere. It suits perfectly a solo traveler or couple. Good wi-fi, supermarket nearby and walkable distance from the main attractions. 1.Great location with walkable distance from the main attractions and train station.2.Staff is very nice. We arrived at mid-night,Anna waited for us at front door.It was very cold.Thanks Anna and her papa.3.The apartment is cozy and clean with everything we need.4.The courtyard is perfect. The location is very central, very well-located in the old city. The owner is nice and helpful. The studio is on the 1st floor, it overlooks the street and the courtyard. It is big enough for 2 people, clean and there is everything you need inside. There is a terrace with one small private table, very pleasant. In Februar it was quiet and well-heated. La ubicación es perfecta, el apartamento cómodo en el Corral del Conde que es precioso y tranquilo. Manuel fue muy atento y nos facilitó mucha información interesante. Apartamento estupendo, no le faltaba ningún detalle: azucar, bascula para pesar alimentos, botiquín, jabón, plancha.... Además, ubicación muy centríca. Estaba todo limpio y muy bonito. Manuel nos recibió con mucha amabilidad. El lugar es precioso, al entrar parece raro pero dentro es un jardin maravilloso. Lo recomiendo a todos. El lugar donde se encuentra ubicado el precioso. Conservando lo antiguo del patio. Un sitio precioso. El apartamento chiquitito pero bien, con comodidades y las personas que lo llevan superatentos, pendientes de todo antes de nuestra llegada, incluso. La localizacion es perfecta. Muy centrico. Se puede llegar a todas partes caminando. El patio "corrala" en donde se encuentra el estudio es precioso y muy tranquilo. See all hotels in Seville. Featuring free WiFi and air conditioning, Coqueto apartamento zona Alameda is set in Seville, 1.1 km from Isla Mágica. Plaza de Armas is 1.5 km away. All units include a flat-screen TV. There is a seating and/or dining area in some units. Average score from 93 guest reviews: 9.9/10. Such a cosy well equipped little apartment, perfect for coming back to in the evening after a hard days sightseeing. Little extras - cava and breakfast much appreciated. And the recommendations for tapas spot on - we wouldn't have found this area otherwise! Very clean, modern apt in central yet quiet location. The owner was very friendly, even bought us breakfast and fresh fruit for the first morning. Great experience! We had a wonderful stay in these apartments. The bed was the comfiest I've ever slept in and angeles had provided everything you could possibly think of. From breakfast to umbrellas, from toiletries to chocolates by the bed. There were even razors and feminine products. We would definitely return for some more of Angeles' wonderful hospitality. Everything, the apartment is just amazing, one of the best I've ever been to. Angeles was extremely friendly and helpful. The fridge was full with breakfast things and a bottle of cava when we arrived and we were able to check out late when we left. The lady owner was lovely, she made us really welcome and gave us lots of information on the best way to get to the city centre and places of interest. we would highly recommend a stay here. Very nice location, in a little street, but close to everything at the same time. Went for a conference and enjoyed very much my stay there. The host is very sympa and her niece speaks very well english :) My compliments! A very cosy appartment with good location. The host gave us lots of recommendations for places to visit and to eat. Would surely reccomend it! BOOK THIS HOTEL NOWSee all hotels in Seville. Featuring free WiFi and air conditioning, Apartamento Nazareno is located in Seville, 500 metres from Triana Bridge - Isabel II Bridge. Plaza de Armas is 800 metres from the property. Private parking is available on site. Average score from 24 guest reviews: 9.9/10. Everything was PERFECT! The host, the apartment, the location, everything. Spacious and brand new apartment with underground parking. The host would do anything to make you feel at home. Information about what to do in Seville, opening hours, tapas bars, history and more will be waiting for you in the apartment. Fully equipped kitchen, super clean, bathroom with everything that you need, from makeup remover to a rain shower. Absolutely brilliant. Thank you! El apartamento es amplio y está completamente equipado. Muy silencioso. Todo muy limpio. El propietario es muy servicial y agradable. L' accueil de Carlos, très sympa qui nous a donné ses bonnes adresses à Séville. L' appartement conforme à la description et très bien équipé. Vom Freundlichen Inhaber erhielten wir sehr gute Tips für prima Essen. Excelente atención y disposición del regente y la ubicación. Situated in the Old town district in Seville, this air-conditioned apartment is 1.1 km from Isla Mágica. The apartment is 1.5 km from Plaza de Armas. Free WiFi is available throughout the property. Average score from 48 guest reviews: 9.3/10. The location of the apartment is very good, the owners are very nice, really clean house, looks like in the pictures on booking. Very warm & detailed welcome received by the hosts. Nice and tidy apartment, located in one of the most characteristic quartier of Sevilla, just a walk far from the very crowded streets of the center but in a livable and typical spanish atmosphere. Been there during the Semana Santa (Holy week of Easter) and our stay was absolutely lovely. We liked the location and the friendly and helpful hosts. The hosts speak Spanish but have a system for translation on a smartphone. The apartment is cute but pretty small. Great for a short stay. Todo en general, los propietarios encantadores, el recibimiento perfecto, el alojamiento perfecto, realmente todo perfecto. Situación perfecta, posibilidad de ir caminando al centro de la cuidad, y muy cerca de la zona de La Alameda, con muchísimo ambiente. Apartamento impecable, con todo el mobiliario y todos los útiles nuevos. Pequeño pero muy acogedor y cómodo. Tanto la ubicación, cerca de todo, como lo confortable del alojamiento. Me gustó todo.Los propietarios muy atentos, el apartamento muy limpio y acojedor, esta todo muy bien pensado para que el cliente se sienta como en su casa.En dos palabras exelente y recomendable. Un apartamento muy acogedor y los dueños muy atentos y agradables. el apartamento muy bien,los propietarios muy amables,en general perfecto. 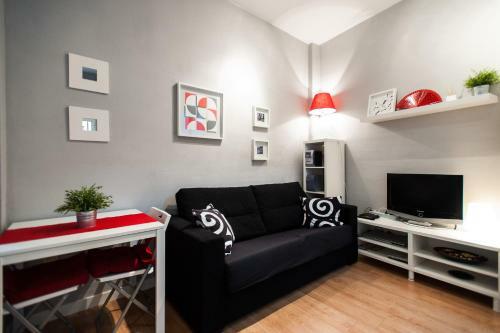 Set 1.1 km from Isla Mágica in Seville, this air-conditioned apartment features free WiFi. Guests benefit from patio. There is a seating area and a kitchen equipped with a microwave. Towels and bed linen are provided in this apartment. Average score from 45 guest reviews: 9.3/10. Location on the edge of the Old Town was great. Easy walk to wherever we wanted to go. Property immaculately clean. Hosts very helpful, but with limited English, which was fine. We worked everything out. Highly recommended. Well located, authentic, less touristic neighbourhood, about 2 km from the main sites, but nice walking in narrow streets / shopping streets. Great host Ms Aurora. Everthing was provided for. Basic stuff for cooking like Oil,salt,pepper. Croissants,cakes,peanuts,kept in the room on arrival. Location is great, within the city center, walking distance from all the attractions. Modern little apartment. Clean, very central, very nice host! Kitchen very functional, so you can easily shop at carrefour market nearby and cook if budget constraints! Tea, croissant, clean towels, shampoo, tv, wifi.. all included! Very nice stay!!! We will be back for sure!!! La amabilidad, los detalles y la buena disposición de los propietarios, nos explicaron en un mapa los lugares destacados de la ciudad y sentimos que podíamos contar con su ayuda en cualquier momento durante el periodo de la estancia si la necesitábamos. El apartamento estaba muy limpio y contaba con todo lo necesario, además está bien situado, en un paseo de unos 20-25 min. se llega a la catedral por ejemplo. También pudimos dejar el coche en un parking cercano por un precio razonable. Nos gustó todo en general, la disposicion y ayuda de aurora , el confort del apartamento, todo lo teníamos al lado, muy contentos y satisfechos, volveremos. 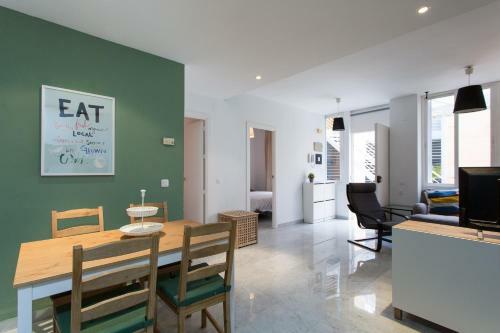 Set in Seville, Espacio 04 is 200 metres from Triana Bridge - Isabel II Bridge. Plaza Nueva is 300 metres away. Free WiFi is provided throughout the property. The accommodation is air conditioned and is equipped with a flat-screen TV. Average score from 49 guest reviews: 9.2/10. I really really liked everything about it from the bed to the WIFI. It is a nicely designed and very well thought out place. It has been recently refurbished and is in a perfect location. You could not find any better in a 5 star place. I have stayed in thousands of places and this place is at the top of my list of places I have stayed!!! The best hotel i have every tried until now . Very good hotel and conditions with the room very new and mordern , have everthing of a Home . very good service profesional and excellent . If you come to sevilla , this is the best hotel . the owner is very helpful everthing in the hotel is clean quiet and mordern and have everthing that travlers need . Apartments on quiet street in the city centre. Privacy from staff and other customers. Public parking house 2 min walking distance (18€). Wify worked fine. Conditioning/heating excellent. The location was very central but in a quiet street, and the shower was great. It was central, 5 min walk to Cathedral but in a very quite street. We loved to have our meals in the balcony. - The manager is a nice guy, very helpful and has a lot of good recommendations; - the flat is luxury: kitchen, washing machine and dryer, much space, etc. ; - a very good housekeeping; - all in all the accommodation was even better than we expected, and we expected a lot. Excellent logement à tous points de vue : situation géographique, accueil, équipements. Notre appartement, au troisième étage, disposait d'une immense terrasse aménagée dont nous n'avons hélas pas pu profiter en raison du temps pluvieux lors de notre séjour. L'accueil attentionné (vin et spécialités locales), les conseils éclairés de notre hôte nous ont permis de passer un excellent séjour. Situated 600 metres from Triana Bridge - Isabel II Bridge in Seville, this apartment features a sun terrace. The air-conditioned unit is 800 metres from Plaza de Armas, and guests benefit from free WiFi and private parking available on site. Average score from 69 guest reviews: 9.2/10. Comfortable, clean and well equipped apartment. Owners very friendly and helpful. Secure parking was a big plus. We parked the car there for four days and walked around Seville with ease. 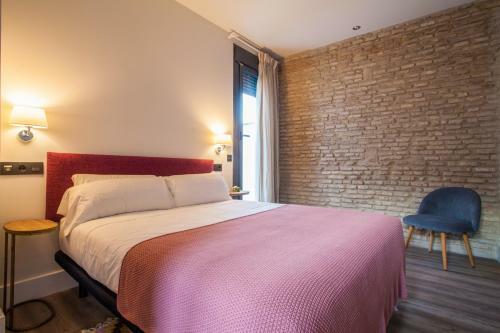 Great location, close to many restaurants, bars, market etc and only a short walk across the bridge to the old town of Seville and all it has to offer. Highly recommended. everything was perfect, location is good and close to old town, garage is in the same building, apartment is new and well equiped, owner is very pleasant but her English is very very limited. she is trying very hard to explain everything. guessing what is she's talking and showing with hands was for me amusing and entertaining and I cannot declare it as a problem or a disadvantage. Very new and nicely decorated appartment. 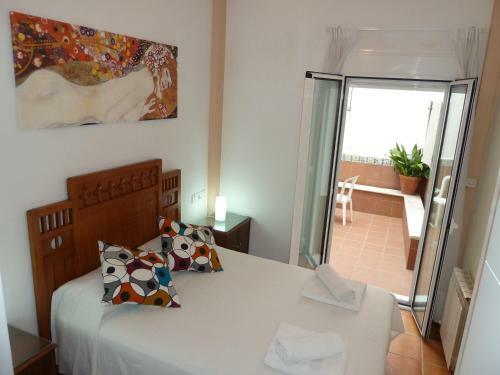 Good location, walking distance to city centre, also Triana is nice. The guy (Antonio) who came to show us the apartment was very helpful. He helped us by telling us the places around and advised us for the best place for Flamenco dance and singing. This place was less than 5 mins walk and opens at midnight. The apartment had everything we need from dishwasher to washing machine. Moreover the place was only 10 min walk from city centre. It had good places nearby for food and pubs and music. And the best thing was it had free private parking. 3 month old nearly flawless apartment decorated with many personal touches and ornaments. Thoughtful welcoming additions: oranges, water, restaurant recommendations. Secure underground parking. Excellent location. Friendly owners whom we got on with despite limited English. Great shower. Washing Machine (but no drier needed in sunny Seville). Very good location, walking distance to city centre. Nice family, little Spanish but still trying to communicate. Beautiful apartment, you can feel that someone used to live in this apartment, it has high quality furniture. Not these purposely ikea furnished apartments. Still it looks very contemporary and harmonised. Great host. Maria is a very warm and helpful person. Beautiful house( full of charming art frames and decorations). Spacious and safe underground parking. Clean bathroom. 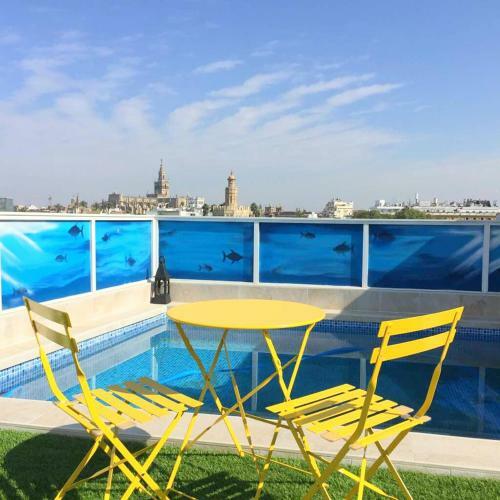 Offering free WiFi and a sun terrace, Apartamento Las Dueñas is set in Seville. Plaza Nueva is 1 km away. Featuring a patio, the air-conditioned accommodation features a seating area with a flat-screen TV and CD player. Average score from 38 guest reviews: 9.1/10. We liked the quietness and how Antonia was so good to get us a kettle when we needed one. A lovely appartment in a good location. The owners were a super friendly and helpful couple There are loads of grocery shops down the street where you can find everything. Great location - walking distance to most tourist sites but in an area that feels more local. Apartamento totalmente equipado, todo nuevo y limpio, zona tranquila, lo recomiendo sin duda alguna. La pareja propietaria muy atenta y amable. Une très bonne adresse bien située, bien équipée, très propre avec une petite cour intérieure bien agréable quand il fait beau. La gentillesse et la disponibilité des hôtes, l'appartement décoré avec goût, la situation géographique, la terrasse, l'équipement..bref, tout! Ottima posizione, appartamento molto confortevole. Proprietaria molto gentile e disponibile. Apartamento muy cómodo y acogedor y todo muy limpio. Nos encanto!! Featuring free WiFi throughout the property, Hostel One Catedral offers accommodation in Seville, 600 metres from Plaza Nueva. You will find a shared kitchen at the property. Average score from 294 guest reviews: 9.0/10. Julius was a great owner and the volunteer there were awesome. They were like a family. Amazing place where you can find a lot of friends)) Free evening dinners are great for communication, breakfast is also free. Everything is clean. Beautifull terrace, very friendly and helpful stuff - so thank you ;)!!! First time as a solo traveler staying at a hostel. I loved it here! I stayed in the female dorm which was very clean and the beds were comfy. The neighborhood was outstanding! The place was a very social. They offer free dinner, walking tours and pub crawls. The whole staff was awesome!!! I would totally book here again!! The best hostel I have ever been to! I was there with a friend: the atmosphere was amazing and the staff always ready to help 24h/24. It is really close to the cathedral (you can have a beautiful view on it from the rooftop terrace), so the position is great. Free dinners were offered every evening and made it easier to meet other hosts. It is perfect for either solo travellers or groups of people.The guys working there even organised supercool free pub crawls every night for those interested. Furthermore the rooms were spacious, superclean and every bed had its own socket+light and curtains to have some privacy. I will definitely come back!!! This hostel is an amazing place and the staff are amazing themselves, very friendly and helpful. Kitchen is great, always clean, a lot of room if you want to cook, even if there is no need for it since there's a lot of free food from the free dinners from the nights before, which is awesome and never seen before, from staying in over 100 hostels around the world. The toilets and showers are clean and without any problems. Beds are really nice and the curtains are good for when you want a bit of privacy. Terrace gets you a great view of the Cathedral. It was a pleasure staying here! The fact that they offered us some quality dinners and breakfasts as well as some cava and rioja wine on Saturday very randomly, all for the price of a smile. Spot on!! This was my first solo trip and my first time staying at a hostel. This hostel was one of the highlights of my stay in Sevilla. The staff are very accommodating and are knowledgeable about the city. I particularly love the free family dinner they have as you get to know other travellers as well as their free night out every night. Bathrooms are clean so as the rooms and everywhere you go pretty much. Highly recommend it! I loved my stay at Hostel One Cathedral! Location was perfect, with everything within short walking distance. The hostel itself was always clean, the free dinners were amazing as were the organised activities and the staff were so friendly and very welcoming. I would definitely recommend when visiting Sevilla! Featuring free WiFi and air conditioning, Karmapartment is located in Seville. Plaza de Armas is 300 metres away. All units have a flat-screen TV. Some units include a balcony and/or patio. Average score from 39 guest reviews: 9.0/10. Everything was excellent, specially Maria (the owner), she is so helpful. The hosts were very kind and informative about what to do in the surroundings and the whole city. Maria was a wonderful hostess, the apartment well located and had everything we needed for our 5-day stay! Понравилось абсолютно все. Собственник, Мария, заранее с нами связалась (с ней удобно можно общаться по вотсапу), спросила о времени прибытия. Мы прибывали около 22.00, она нас встретила в апартаментах, отдала ключи, составила карту для нас, отметив все рестораны, бары, рынки рядом. Мы умудрились оставить ключи в дверях в один день и захлопнуть дверь, так ее муж оперативно прибыл и все нам открыл. В ванной есть шампунь, гель для душа. Квартира полностью оборудована: тостер, фен, холодильник, плита, посуда. Все достопримечательности в пешей доступности. В общем, в следующий раз обязательно здесь остановимся! Excelente trato por parte de los dueños, prestos a atender cualquier clase de duda o información. nous avons beaucoup apprécié l'accueil chaleureux de Maria qui a préparé un petit guide très pratique avec les endroits à visiter, les restaurants, les supermarchés.elle a pris le temps de nous expliquer tout alors qu'elle avait un bébé de deux semaine. l'appartement est très bien équipé et bien situé. Located 5 minutes' walk from Las Setas in Seville, this apartment features a balcony and views of the city. Free WiFi is offered throughout the property. There is a seating area and a kitchen complete with a microwave and a toaster. Average score from 32 guest reviews: 9.0/10. Close to the Santa Justa train station and also old town. Friendly host. Remember to inform the host your time of arrival. We were alright, we got off the taxi right in front of the property but on a narrow pathway and the owner heard us on upstair and let us in the apartment right away. Nice big apartament , good facilities, good value for the money. Tutto super ottimo, lo consiglierei a tutti, sia famiglia che a singoli, pulito,tutto a portata di mano, personale gentile e disponibile. Ottimo, ottimo, ottimo, ottimo, ottimo. L'appartamento è estremamente spazioso, il personale è stato di una gentilezza incredibile e siamo riuscite a raggiungere praticamente tutto a piedi. A localização, a simpatia e uma óptima relação qualidade preço. Cómodo y espacioso, a 15 minutos andando de la Giralda, tiene wifi y aire acondicionado. Muy limpio. 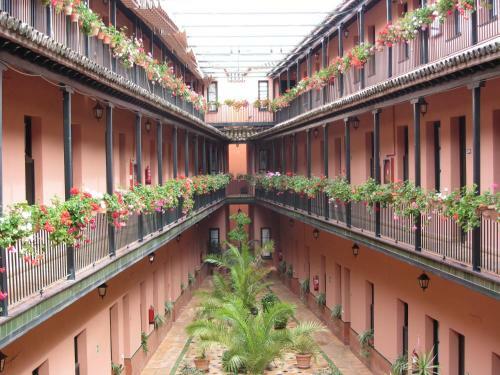 Featuring free WiFi and air conditioning, Apartamentos Duque Cornejo is located in Seville. Plaza Nueva is 1.5 km away. The accommodation comes with a seating and dining area. Some units have a terrace and/or balcony with city views. Average score from 44 guest reviews: 8.9/10. The apartment was self contained and in a good location. Gran trato el recibido por el personal, nos dio una guía con información para que pudieramos disfrutar de la ciudad, muy amable y buen trato. El apartamento estaba bien situado y es muy comodo. los dueños fueron encantadores. Nos permitieron salir más tarde de la hora puesto que participábamos en la maratón. Habían dejado leche y café. Tamaño ideal para una pareja. El apartamento se encontraba muy cerca de todo,estaba limpio, y la cama era cómoda. Las dueñas nos aconsejaron varios sitios para tapear que fueron todo un acierto. Excelente limpieza, amplitud y confort. Muchos detalles que marcan la diferencia. Spacieux, confortable, très bien equipé, calme: l'appartement parfait ! Apartamento muy bonito, la dueña muy amable y estuvimos muy cómodos. Located in Seville, this apartment features free WiFi. The apartment is 1.3 km from Isla Mágica. There is a seating area and a kitchen. A flat-screen TV is available. Plaza de Armas is 1. Average score from 30 guest reviews: 8.5/10. A witty way of transferring keys, very fun and independent. The location is just great, though it is almost impossible to park even for unloading luggage. The place is quiet and cosy, and the host is very helpful. The host is helpful and nice, she allowed us to check out until 6pm. It was a small cozy apartment, with 1-2km walking distance to the old town center. Reyes was a wonderful host, warm, accommodating.The apartment was neat and clean, well-equipped for a short stay, locates at the residential area, away from the tourist crowd, but not too far from major sights, a lot of good restaurants nearby. La atención de los anfitriones fue INMEJORABLE, absolutamente atentos, amables, detallistas, excelentes personas orientadas a servir y facilitar la estadía a los huéspedes. El lugar situado era precioso, la casa amplia y cómoda. Ligging in rustige omgeving met zeer veel goede restaurants. El apartamento es muy cómodo y hay espacio suficiente (estuvimos 2 personas). Hay dos camas grandes tipo litera en la misma habitación. La cocina es pequeña pero suficiente para pasar unos días, además ya tiene lo básico: aceite, sal... La dueña muy amable, aunque no coincidimos en persona, nos dio todo tipo de facilidades: para recoger las llaves, o ucalquier pregunta que tuviéramos. Además pasamos el día de reyes ahí y ¡nos dejó un roscón de reyes como bienvenida! El apartamento estaba muy limpio y arreglado. Se ve todo bastante nuevo. 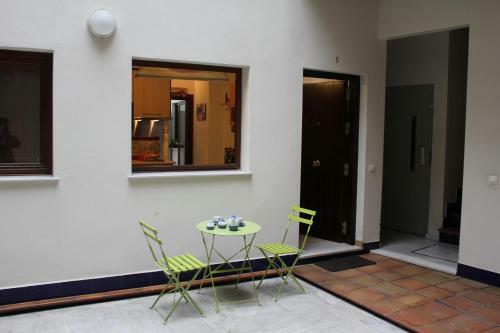 Guest House Martinez Montañes offers accommodation in Seville. The rooms are fitted with a shared bathroom. Guest House Martinez Montañes features free WiFi throughout the property. You will find a shared kitchen at the property. Average score from 181 guest reviews: 8.4/10. Very close to bus station (arrival from Portugal,departure to Cordoba), easy flat walk to centre along mostly pedestrianised streets.Juan and his German assistant were friendly and helpful.Good roof terrace - drying clothes, seats and tables. The place is amazing! I felt like home. 5 minutes walk to Plaza del Duque, where you can find great places to eat have breakfast (La Campana) and eat churros and chocolate! But you can cook your own meal, you have a complete kitchen. Close to Torneo Avenue, you can run along the river. Plaza de Armas, where you take the bus to the airport, is 15 minutes walk. And the host is an amazing person! Very friendly and helpful. I recommend! The owner was very nice and helpful. Localisation is very good. The room was clean, the bathrooms also. There is also fully equipped kitchen that can be used. I really recommend this place! Juan was very helpful all the time. Is a nice place and make you feel like home. We had a terrific stay at Juan's guest house! He was very kind and helpful, told us which places to visit and where to get the best tapas (and he was right about all of them!). The rooms were perfect for a city trip to this beautiful city. Oh and the roof terrace is just perfect for a relaxed moment after your siesta ;)! Also the street in which the apartment was located was quiet, we didn't experience any noise but still everything was on walking distance. Everything was nice and good, we will go again if in city. Felt cozy. Comfortable beds, nice staff, good location and perfect price/quality. I recommend this guest house. Pensión Las Setas is situated in the historic centre of Seville, 100 metres away from Las Setas viewpoint and 10 minutes' walk from Sevilla Cathedral. Pensión Las Setas features free WiFi throughout the property. All rooms are air-conditioned. Average score from 482 guest reviews: 8.4/10. We checked in very late, despite it being clearly stated that the check-in window was between midday and 8 pm. The host was kind enough to wait around for us until 11 pm and checked us in at no additional cost. This gesture was very much appreciated. It was very clean and comfortable. The staff was sooo nice! We love this place! 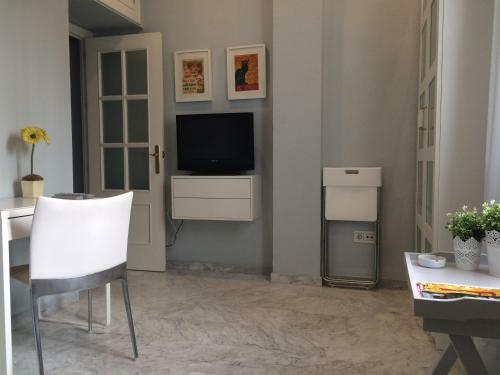 For so low price we got very nice and wide room with modern interior and everything we needed + there was 2 authentic balconies with view on cute old streets of Sevilla. Pension is situated in the center not far from Metropol Parasol, which is the best point to start exploring the city. Guy in the hostel was very friendly and was always online, he also gave us a map and advised very cool places. Thank you! Room was fantastic. Great location, close to nightlife. Staff are very friendly, very helpful in giving directions, etc. Price is brilliant. Excellent value. Located in Seville, this air-conditioned apartment features free WiFi. The apartment is 800 metres from Isla Mágica. The unit equipped with a kitchen with an oven and microwave. A TV is featured. There is a private bathroom with a bath or shower. Average score from 50 guest reviews: 8.3/10. 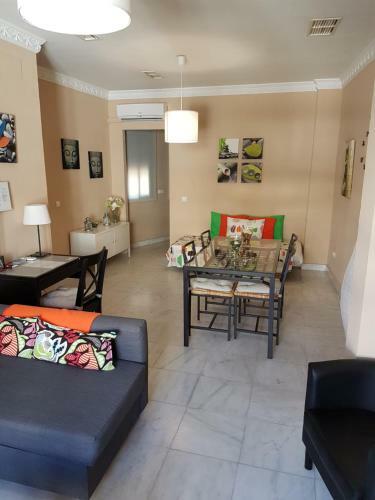 A tranquil, cosy apartment on a quiet street with all needed facilities.Very friendly owner.The only negative aspect was the difficulty to find a parking spot in the area, but this counts for almost all Spanish cities. Good wifi, coffee machine and the owner is friendly. Приветливый хозяин, встретил, помог припарковать машину, уютная квартира в спокойном месте, рядом самые красивые места в городе. tutto nuovo, pulito, tranquillo, molto corredato ( cucina,frigorifero, tv, macchina caffe, forno microonde e perfino lavatrice) , proprietario molto gentile e disponibile., a due passi dal fiume fantastico, 10 min. a piedi dal centro. consigliatissimo,. sicuramente ritorniamo. apartamento simples mas super confortável, com todas as comodidades. lençóis, toalhas, loiças de cozinha e ate café! adoramos. Muy buena ubicacion, muy cerca del centro y al lado de una plaza llena de restaurantes y mucha gente joven. El papartamento está muy bien equipado es igual que en las fotos y muy limpio. Отличная уютная светлая квартира. Есть все, что необходимо для проживания - просторная гостиная, нормальных размеров ванная комната, небольшая кухня (есть холодильник, плита, кофеварка, микроволновая печь, посуда, даже ведерко для льда, если вдруг захочется шампанского). Есть принадлежности для глажки, стиральная машинка. Сигнал wi-fi отличный. Поблизости пара отличных тапас-баров! Accueil chaleureux, très bien situé : au calme pendant la semaine sainte et à 20 min du centre. Très bien équipé ! La ubicación era perfecta para las necesidades que teníamos. 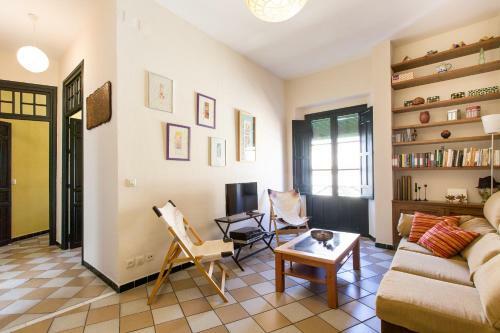 Situated 900 metres from Plaza Nueva in Seville, this apartment features a patio and a garden. The air-conditioned unit is 1.3 km from Triana Bridge - Isabel II Bridge. Free WiFi is available throughout the property. Average score from 11 guest reviews: 7.0/10. Set in Seville, this air-conditioned apartment features free WiFi. The apartment is 1.1 km from Isla Mágica. The kitchen comes with a dishwasher and a microwave. Towels and bed linen are provided in this self-catering accommodation. Average score from 48 guest reviews: 9.9/10. Perfect spot tucked away on a quiet street in La Macarena, loads of neighbourhood bars and cafes nearby. Felt like living as a local. Seeing the local 'pasos' for Semana Santa was a real highlight, especially the final one on Easter Sunday in the street just behind the apartment. The apartment had everything we needed and it was easy to contact the owner. Within walking distance of all we wanted to see. Modern interior design. Beautiful mint SMEG :) Perfectly equipped. Fast internet. Neat staircase. Very friendly and helpful owner. The apartment is lovely and cozy. Belen was really kind to us and gave a lot of information on dining and leisure. Enjoyed the stay a lot! The host Belen she was very welcoming. She provided us with everything we needed and recommended loads of fantastic places in the city to visit, had a nice Christmas vacation in Seville, Thanks! It is perfect, best home in Sevilla! Belen and Jaime are so wonderful as host. Thank You so much ! Beautiful apartment. Very nice and comfortal furnished. Clean and everything needed was there. Friendly people to welcome us. We had a very pleasant stay at Parras 22/8. Belen is very friendly. She gave us a lot of tips for Sevilla. The appartment is very trendy and neat. With al the facilities you need. Also the refrigerator was filled with drinks, water, bread, cheese etc. There were nog geusts after our stay so we had a late check out. ( no charge for it) It was perfect!! More than excellent. Very friendly reception by the couple renting the place: they created their own map with the best local tips. Apartment is nicely furnished/decorated and perfectly spotless. Fridge is equipped for a first breakfast, free of charge. Great neighborhood. 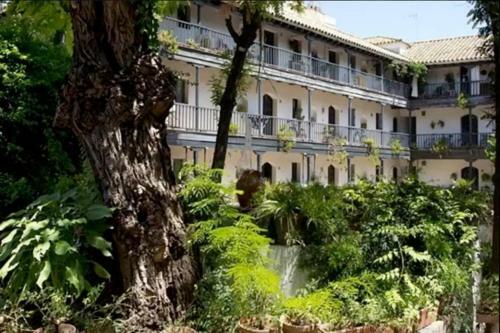 Located 2 km from Seville Cathedral, La Buhardilla Morada offers accommodation in Seville. The air-conditioned unit is 1.5 km from La Cartuja Island and 10 minutes' drive from Isla Mágica. The kitchen features a microwave. Average score from 39 guest reviews: 9.7/10. Hosts were fantastic and very helpful with everything. Location was wonderful. Easy bus connections, great neighborhoods nearby. Small but really nice apartment, fully stocked and easy to use. The Accommodation is perfect for a couple wanting to stay in Seville old town. Beautiful flat with all the necessary facilities to make your stay very comfortable. 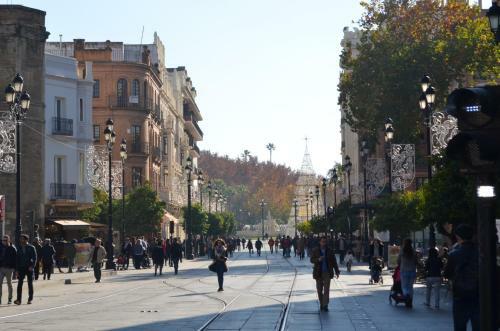 In the most lively district of Sevilla, but in a peaceful street where you can rest and relax. Highly recommended! Very nice little but cosy appartment, located in the old town. Helpfull and proud owners. Rent a bike nearby to visit the entire city. Place was amazing, great location. Really clean studio with all what you need. Very celan Flat With friendly and helpful owners. I would recommend it. Nice area of the city and not that far from the center. El apartamento es super confortable y muy completo. Tiene todo lo necesario para hacer de tu estadía lo mejor. Extremadamente cuidado en todo los detalles. La dueña super amable. Tutto splendido! Appartamento ristrutturato, pulito, profumato! Ci siamo sentiti come a casa! Miriam ed il marito gentilissimi! Grazie ... alla prossima!!! Todo excelente. Cuando llegamos nos estaban esperando, el piso es bonito, con todo lo necesario y estaba impecablemente limpio. La ubicación es buena, a unos 15 minutos caminando del centro. Set in Seville, this air-conditioned apartment features free WiFi. The property boasts views of the city and is 900 metres from Isla Mágica. There is a dining area and a kitchen equipped with dishwasher. Average score from 18 guest reviews: 9.7/10. Victor the manager was extremely helpful and spent 15 minutes giving us a guided map tour of Seville. Flat was in a busy neighbourhood full of excellent tapas bars, but was very quiet. Apartment was lovely, pictures didn't do it justice. In a great location and Victor was amazingly helpful with some great restaurant recommendations. The host made the effort to meet us at the property even though it was really late at night. 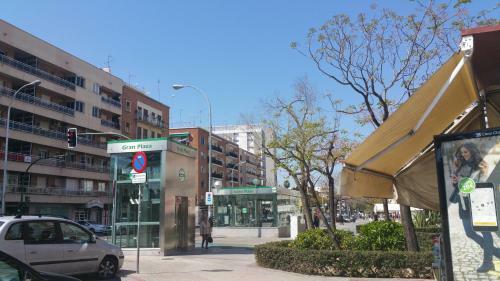 Great location within walking distance of the main areas and some lovely Tapas bars nearby. The property itself was clean and very homely. Loved the appartment in all its detail. Appartment so comfy that wish we could stay longer, it felt like at home. Excellent air conditioning. Best ever host Victor who provides all necessary recomendations of the city visit. Location of the flat was perfect, the roof terrace made a great addition! 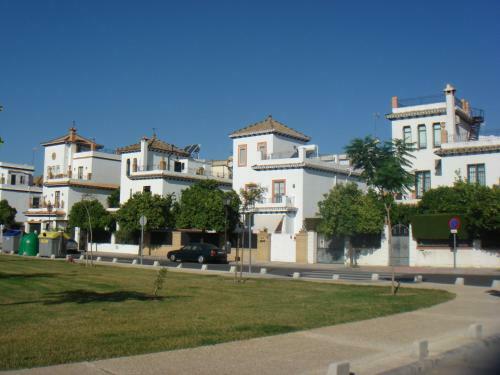 Great location north of the Sevilla city Centre. Everything in walking distance. Many restaurants and bars very close to the apartment. Efficient landlord. Big apartment with a rooftop terrace. Geweldig appartement. Alles er op en er aan. Leuke buurt ook. Super Lage, wir haben die ganze Stadt zu Fuß durchwandert. El apartamento esta muy bien situado, esta limpio y bien equipado. Victor, el propietario es muy atento, nos indico lugares de interes tanto culturales como gastronomicos. Tres bien placé, propre, bien équipé (clim), terrasse et grâce aux infos de Victor nous avons passé un agréable séjour merci encore ! Situated in Seville, Apartamentos Prada is 1.1 km from Plaza Nueva. Plaza de Armas is 1.2 km away. Free WiFi is available . The accommodation is air conditioned and features a seating area. Some units feature a terrace and/or balcony. Average score from 33 guest reviews: 9.6/10. Antonio was a superb host - and his English is much better than he thinks it is! The duplex was really spacious, with everything you'd need for a home away from home. The roof terrace in particular was stunning, and we spent some lovely mornings and evenings there having breakfast or a glass of cava. Antonio was so friendly welcoming us to the property, he spoke excellent english and gave us recommendations for places nearby to eat and drink as well as things to do. It was a pleasure staying in his apartment which was extremely clean and tidy, and decorated with impeccable taste. The roof terrace was also lovely, I just wish we had a bit more sun when we were there! 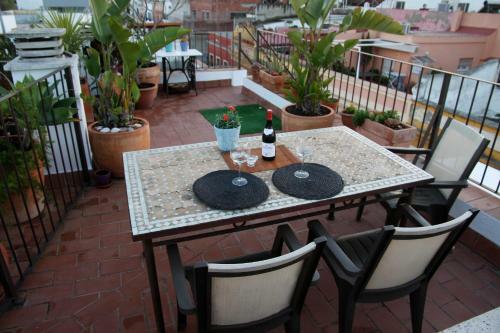 The apartment is immaculate, a great value place to relax with an excellent roof terrace. There is a super market around the corner and the great local bars and tapas places within a 5 to 10 minute walk. Can't fault it. The apartment was very well equipped and the terrace outside the bedroom was excellent, just right for morning coffee and relaxing in the afternoon/evening. The owners were very friendly and helpful. There is a small supermarket a short distance away and it's not that much further to Alameda de Hercules where there are plenty of bars and restaurants, Café Eureka was a pleasant café/bar for an early evening beer and I would definitely recommend Duo Tapas but you need to get there early or reserve a table, the food is very good. The apartment was excellent. Everything you would need is provided. The host was really helpful I would thoroughly recommend this property and the area in which it is located. 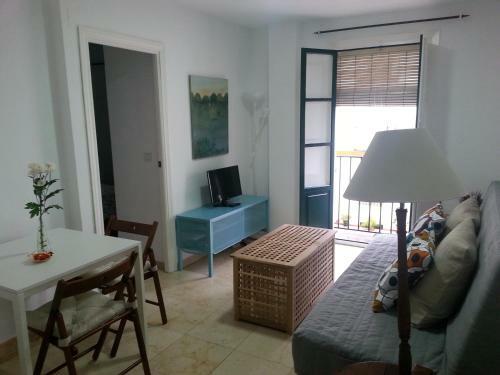 The apartment is perfectly situated within the narrow street of La Macarena. The house Prada 9 is in a little side lane which is secluded with a private gate. The owners are very friendly and they speek a bit English (even if they deny it ;-) ). We got tickets for a 48h bus tour at a reduced price from the owner (16 instead if 18 EUR). The apartment was very clean and well equipped, we could prepare meals in the kitchen and there was a dish washer and a washing machine. The beds were big and comfortable, the wifi was fast, there was AC in the living and bed room and it was nice to sit on the little patio with a glass of wine in the evenings. The owners want to build a staircase up to a roof top terrace which future guests will be able to enjoy! There is a Dia supermarkt just a few steps away, which is very handy.It was quiet at night and we had a good sleep. I can definitely recommend this place! El apartamento es muy cómodo y está muy bien ubicado. Lo recibimos En excelentes condiciones de aseo y está muy bien equipado. Para destacar la amabilidad de su dueño (Antonio) quien en todo momento se preocupo por que estemos cómodos (incluso se tomó la Molestia de ir al Correo a buscar una encomienda que nos mandaron de cosas que nos habíamos olvidados en otro hospedaje). Para recomendar!! Sin duda volveríamos. Nous avons tout adoré : cet un appartement très beau et confortable, idéalement situé dans le centre ville historique et, pourtant, très calme. Les propriétaires habitent dans la même maison et sont incroyablement accueillants. O apartamento é lindo, confortável, silencioso, aconchegante, muito limpo Tem um ótimo sistema de calefação. Bem equipado e cheio de amenidades disponíveis, como shampoo e gel ducha. Os proprietários moram no andar embaixo e são muito simpáticos e solícitos, disponíveis por WhatsApp. Set 900 metres from Triana Bridge - Isabel II Bridge in Seville, this air-conditioned apartment features a balcony with garden views. The apartment is 1 km from Plaza de Armas. Free WiFi is offered throughout the property. Average score from 16 guest reviews: 9.5/10. Everything. a Good bedroom, a good bathroom, a good livingroom, and a good kitchen. Host was so kind and consider. too.I hope to stay again someday. Clean and quiet apartment in a perfect location. Walking distance to the city centre with cafes, supermarkets and tourist locations close by. I would highly recommend a stay at this apartment. The host Pedro is a welcoming and friendly. Location, walking distance to town centre and tourist spots. Very quiet, warm and comfortable small apartment, well-equipped. Host very helpful, came to find us when we couldn't locate the apartment. Our fault as we don't speak Spanish and the location should not be difficult to find. Hay de todo,lavadora, lavavajillas, secador de pelo, tostadora,cafeteras,aa/calefacción, wifi...y todo funciona perfectamente! Lo mejor la cordialidad del propietario que nos atendió muy amablemente cuando llegamos bien de madrugada. La zona muy tranquila,con bares de tapas en la misma calle,supermercados y paradas de bus. Repetiremos!! Ubicación, limpieza perfecta, trato del dueño perfecto. En general perfecto. Muy buena impresión desde el principio. Bonito, cómodo, sin ruido, con aire acondicionado. Urbanización moderna y vigilada. (No es una casa antigua en el centro de Triana). En la misma calle hay todo lo necesario: supermercado, tiendas, bus, buenos bares y restaurantes. A pocos minutos de la estación de autobuses Plaza de Armas. Para ir al puente de Triana se va por calle Castilla pasando por bares de tapas, tiendas flamencas y viendo el rio y se llega enseguida dando un paseo agradable. Me gustó todo el general, el apartamento es muy acogedor no le falta detalle. La cocina muy completa. El cuarto de baño tiene una gran bañera. Tiene una pequeña terraza en el salón a parte de un terraza cubierta en la cocina. Tiene aire acondicionado con bomba de calor perfecta para caldear el piso. El dueño muy simpático estuvo en el punto de encuentro en cuanto le llamamos incluso antes de la hora de entrada que se establece en la reserva. La zona tiene mucho movimiento con muchos bares y restaurantes pero por la noche reina el silencio porque el apartamento da a un patio interior custodiado por un conserje, así que no hay ningún problema. Por mi parte todo perfecto! El apartamente es tan cual aparece en las fotos. En una buena zona, tranquila pero con todo lo necesario cerca: supermercados, restaurantes, farmacia, parada de autobús...A un agradable paseo del centro. La atención del dueño es excelente, muy amable. Een heel comfortabel appartement. Volledig ingericht (incl. o.a. wasmachine). Gratis parkeergelegenheid in de directe omgeving, al kan het wat moeite kosten om een vrij plekje te vinden. Rustig gelegen aan parkje aan achterkant van drukke straat. Winkels, bars en restaurantjes in directe omgeving. 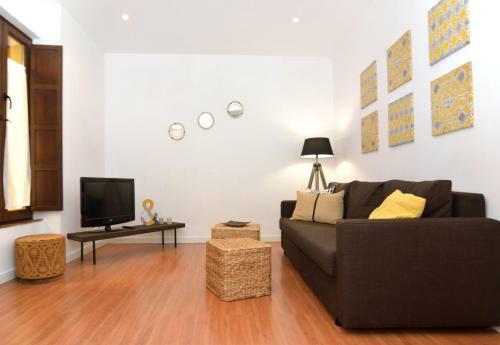 Loft Jardines Murillo is an apartment located in Seville, 800 metres from Plaza de España. The apartment is 1.1 km from Plaza Nueva. Free WiFi is available throughout the property. A dishwasher and a microwave can be found in the kitchen. Average score from 20 guest reviews: 9.4/10. Very spacious, comfortable, fully equipped apartment, very close to the historical center of Seville. Super clean, large bathroom. Kitchen had dishwasher machine, washing machine, iron, blender and anything you need for serving table, in a very modern furniture. Very good Wi-Fi. Close to a very cheap parking space (1 euro/day). Понравилось все! С первых минут общения, нас даже сопроводили и показали на автостоянку за 1€...!!!!! Это правда, три дня 1€.... в центре города. Очень все близко и удобно. Чисто. Город как всегда прекрасен )... Рекомендую. La ubicación era estupenda. También nos encantó la decoración, limpieza y lo grande que es el piso. Nos encantó! Localizacion fantastica. Muy cerca del centro y de las atractaciones turisticas. La ubicación, que el apartamento era nuevo, cómodo y estaba limpio. Locatie, aardige eigenaar heeft ons naar parkeerplaats gebracht, schoon. El apartamento es tal cual las fotos. Todo nuevo, muy acogedor. Perfecto. Céntrico. 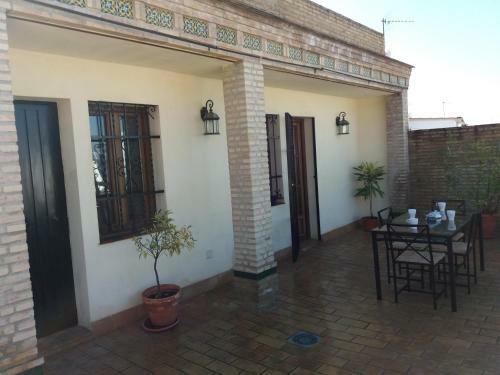 Set 700 metres from Plaza Nueva in Seville, this apartment features a patio. The property features views of the garden and is 1 km from Plaza de Armas. Free WiFi is provided throughout the property. Average score from 4 guest reviews: 9.2/10. Offering a sun terrace, Un Viaje al Pasado en el Centro is situated in Seville. Isla Mágica is 900 metres away. Free WiFi is provided throughout the property. All units are air conditioned and feature a seating and dining area. Average score from 22 guest reviews: 9.1/10. Seville can be very noisy at night but as this is an off-street courtyard it was lovely and peaceful, but only yards from the Alameda. Very spacious and protected from the sun. The flats are all super nice. The owner of the appartment was was very helpful. He also had some advices for the city trip. It is a convenient place for travelling by bus (to other cities) and also by plane. Bus station is close. There was coffee and coffee machine :) It was very clean. Super nice and friendly hosts. Spacious apartment, all facilities included, free wifi. Good location, still in the city centre with plenty of cafes and restaurants around, although about 10-15 minutes walk from the old town and all the monuments and museums. Juan el propietario fue encantador, nos preparo información de rutas turistica así como de medios de transporte, explicandonos todo detalladamente. El apartamento era muy bonito y la ubicación excelente, recomendable al 100%. A parte la posizione ottima,l'assistenza e la disponibilità della proprietaria e anche della ragazza che ci ha accolto"Maria"molto gentile. El buen trato que recibimos por parte de Juan, quien puntualmente nos abrió el apartamento y nos dio una utilísima información para sacar máximo partido a nuestra estancia en Sevilla. El dueño nos recibió y era majisimo, nos preparó una hojas con diferentes rutas por la ciudad y en todo momento de los días te resolvía dudas que tuvieras. Featuring free WiFi throughout the property, Apartamentos Sevilla Palace is set in Seville, 900 metres from Plaza Nueva. Plaza de Armas is 1 km away. Some units include a dining area and/or patio. Average score from 110 guest reviews: 8.7/10. Apartment very well located in the center of Seville, this new and equipped with all necessary utensils, very comfortable bed and everything in general perfect. Apartment very nice and comfortable, good location and quiet to rest, are the same as the photos, are highly recommended. The apartment is spacious, comfortable and beautiful. It looks just like the pictures. A short walk from Alcazar and most sights. The flat is amazing!! !For a studio it is HUGE!!! We loved it very much and had an excellent time there.It's exactly like in the pictures.Haha we want the same one back in London.the flat is located in Old town and there is lots of restaurant and bar nearby.Not far from the main shopping street and a good walking distance to the main sightseeing.The hotel which the flat belongs to is 3 mins away from the flat. If you need anything you can ask them they are really helpful and nice. If I'm going back to Seville I will try to get the same apartment for sure.It's my first review ever but I think they deserve it. (Sorry for my writing but English is not my mother tongue lol). 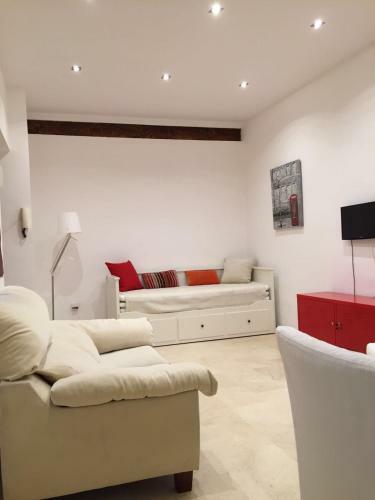 Super nice apartment located in the center of Sevilla. Everything is in walking distance. Apartment was lovely and clean and the bed, especially the pillows were super comfy. Easy to get the key of the apartment at the reception desk of the Sevilla Palace Hotel. Big and clean apartment, great location in calle Feria. Free snacks and water in the fridge. Situated 700 metres from Barrio Santa Cruz in Seville, this air-conditioned apartment features a patio. Offering off-site private parking, the apartment is 1 km from Plaza de Armas. Free WiFi is available . Average score from 15 guest reviews: 8.7/10. L'emplacement géographique au coeur de la vieille ville de seville, en pleine ambiance et à proximité de tous les monuments historiques et la région de shopping. Magnifique!! Limpieza, ubicación, el apartamento en general. Lo recomiendo y al dueño también, muy amable. Ottima la posizione,non adatto a 4 persone.molto gentile e disponibile il padrone di casa.prezzo ottimo. Lo céntrico que estaba el apartamento, la amabilidad del casero y lo preparado que esta, teníamos de todo. 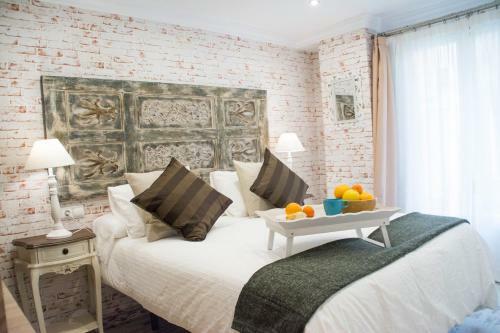 Set 1.8 km from Plaza de España in Seville, this air-conditioned apartment features free WiFi. The unit is 2.7 km from Plaza Nueva. Private parking is available on site. A microwave, a toaster and a fridge can be found in the kitchen. Average score from 16 guest reviews: 8.6/10. Situated 700 metres from Plaza Nueva and 1.1 km from Triana Bridge - Isabel II Bridge, Apartamento Calle Lirio offers accommodation in Seville. The apartment is 1.3 km from Plaza de Armas. Free WiFi is offered throughout the property. Average score from 15 guest reviews: 8.5/10. Offering a seasonal outdoor pool and views of the city, Itaca Boutique Artemisa is located in Seville in the Andalucía Region, 1.1 km from Plaza Nueva. Rooms are equipped with a flat-screen TV with satellite channels. Rooms have a private bathroom. Average score from 923 guest reviews: 8.4/10. 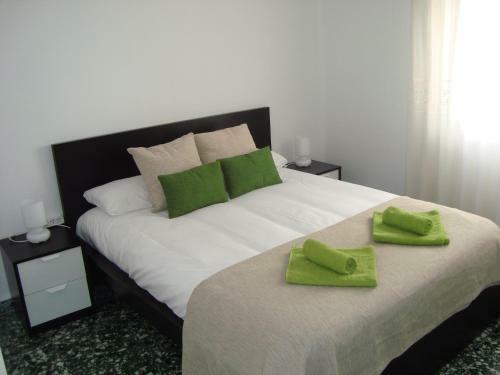 Featuring air conditioning, Sevillarent is located in Seville, 1.5 km from Plaza Nueva. Triana Bridge - Isabel II Bridge is 1.8 km away. Free WiFi is offered throughout the property. Average score from 40 guest reviews: 8.2/10. Апартаментът беше много голям. Имаше 2 бани с тоалетни (към всяка спалня). Всички уреди работеха. В близост има супермаркети и пекарни. Домакините бяха много любезни. Предоставиха ни карти на района и списък със забележителностите в Севиля (с работното им време и цена). Todo en general. Es un apartamento en el que uno se siente como en casa. El trato con el responsable muy bien, nos informo de zonas a visitar y nos facilitó mapas y planos de la zona. El apartamento esta muy bien, esta bastante nuevo y cuidado, es amplio y muy limpio. Volveremos. Het appartement was super schoon en netjes. In de keuken was alles aanwezig wat je nodig hebt. Zeer goede prijs/kwaliteit. 10 minuten lopen van het centrum. Apartemento amplio y con todos los requisitos para que una familia de 4 o 5 pase muy a gusto su estadia por sevilla. 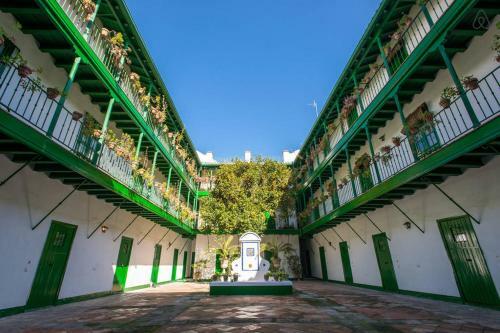 Located in Seville, this air-conditioned apartment features free WiFi. Guests benefit from balcony. A microwave and a toaster can be found in the kitchenette. A flat-screen TV is available. Average score from 150 guest reviews: 7.6/10. 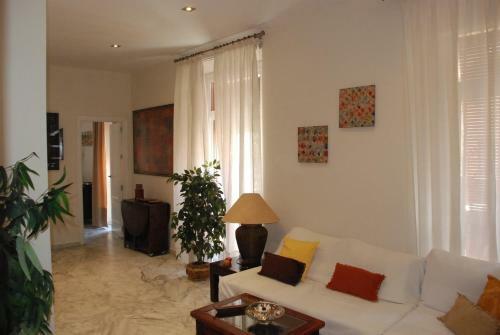 Apartamento Venecia Arenal offers accommodation in Seville. Apartamento Venecia Arenal boasts views of the city and is 300 metres from Plaza Nueva. Free WiFi is provided . Average score from 41 guest reviews: 10.0/10. the apartment is near the church and bullring，you can walk there in about 10 mins. You can see the church at the roof. It's quite at night. The hoster wait us and show us everything. if you want to pay by card please email them, or you need pay by cash. Nos gustó mucho la ubicación. Muy céntrico. 4 minutos máximo catedral y Giralda. Y lo mismo Torre del Oro, Paseo de Colón. Cerca de todos los sitios interesantes. Tanto Javier como Maribel, están a tu disposición en todo momento. El Apartamento muy limpio. Y no necesitas transporte para nada. La calle llena de bares y restaurantes. El Barrio de Triana cerca. Y Santa Cruz también. Recomiendo callejear por las calles del apartamento. Muy bonito y con encanto. Y el trato de los dueños genial. Te encuentras como en tu casa. L'appartamento, spazioso e provvisto di ogni confort e servizio, è situato in pieno centro. Dalla terrazza comune è possibile godere della vista della città, con la cattedrale illuminata di notte, proprio a due passi. Il proprietario si è dimostrato attento e disponibile, spiegandoci tutto nel dettaglio e suggerendoci i luoghi da visitare in zona. Rapporto qualità/prezzo imbattibile. Consigliatissimo. Located 1.3 km from Triana Bridge - Isabel II Bridge, Apartamento El Hechizo offers accommodation in Seville. The apartment is 1.3 km from Plaza de España. Free WiFi is offered throughout the property. Average score from 38 guest reviews: 9.6/10. The property met all our needs and was within easy walking distance of all the attractions Seville has to offer. Our host Jose was available to answer any questions we had and was very helpful in every way. very good apartment. confortable, clean, cose to the downtown and good help from the host, Mr. Jose. my 6 family was there for 3 nights. nothing problems. if you have a plan to Sevilla, I can sure that this apartment will be the best choice for your trip. A very very nice host!! !He has given us many useful suggestions!! Excellent location! The rooms are very comfortable It felt like home!!!!!!!!!!!!!!!!!! The facilities at this apartment were overall quite good. Kitchen was fully stocked. There are three bedrooms with 4 beds, which was more than adequate for our party of 5. There is only one bathroom, which can sometimes be a bottleneck when getting ready to leave. The host was wonderful. It is a pleasant 15-20 minute walk to the core historical area, but the main train station is 45 minutes away. The host was so kind,we all feel his warm welcome at the first met,and were comfortable during our stay,he even considerably ask if we need help everyday and give suggestions of Seville tour in city,thanks for the beers and cold drinks in the refrigerator,most of all,after check out,we continue our city tour,he even take our luggages to meeting point by his car at 15:00,and drove us to the bus station free! What else can you expect more? We truly recommend everyone on this stay in Sevilla. The owner was fantastic man and very helpful. Everything was on place. Propietario muy amable y dispuesto a brindar toda la información y ayuda para que nuestra estadía transcurriera de forma excelente. 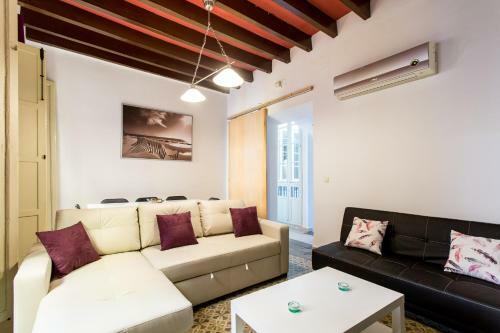 Set in Seville, this air-conditioned apartment is 400 metres from Plaza Nueva. 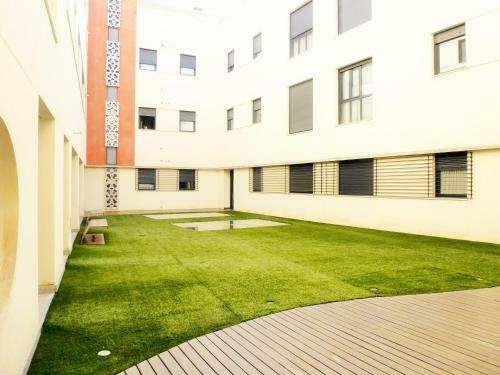 The unit is 700 metres from Triana Bridge - Isabel II Bridge. Free WiFi is provided throughout the property. Average score from 27 guest reviews: 9.5/10. We really loved the central location, it was close to everything. Most of all we really appreciated the excellent service that Angel, gave us. That made all the difference to our stay. Very central, close to Plaza San Salvador. Extremly quiet apartment, facing to a patio. Spacious apartment with everything you need. Even free coffee capsules for the machine. Owner/renter very friendly and relaxed, was there on time for handing over the keys. Lo mejor sin duda es la ubicación. En pleno centro de la ciudad puedes llegar andando a todos sitios. Cómodo,acogedor, limpio... recomendado tanto para fin de semana como estancias largas. Todo excelente. La ubicación es inmejorable en pleno centro de la ciudad. A 3 minutos andando de la Catedral y justo al lado de la iglesia del Salvador. Hay un supermercado a 2 minutos , perfecto. El apartamento es súper tranquilo y descansamos muy muy bien. La cama es comodįsima. Se nota que cuidan los detalles. Ángel es encantador y muy servicial. Todo lo que necesitamos nos lo arregló al instante y nos recomendó muchos sitios para salir y visitar. Para repetir! Muy recomendable! Muy buena ubicación, limpio, cómodo y confortable. Y el chico que nos lo alquiló tuvo la deferencia de dejarnos quedarnos mas tiempo para evitar ir arrastrando la maleta por la lluviosa Sevilla. Perfecte locatie in een rustig straatje in het centrum van Sevilla. Mooi verzorgd appartement. Lo mejor del piso es la ubicación, muy cerca de las atracciones turísticas de la ciudad. El piso es cómodo y está bien dotado. Ángel (nuestro anfitrión) fue muy amable. 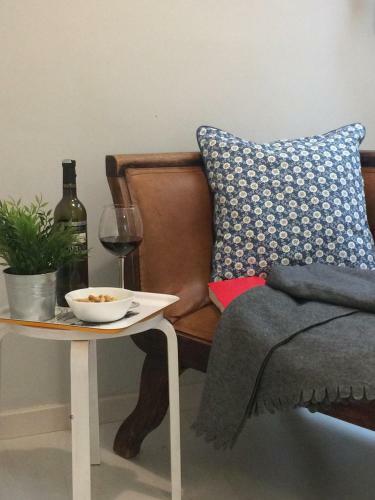 Set in Seville, this apartment features free WiFi. The apartment is 700 metres from Plaza Nueva. A dishwasher, an oven and a microwave can be found in the kitchen. Towels and bed linen are available in this self-catering accommodation. Average score from 20 guest reviews: 9.3/10. Location is super - Santa Crus - it's the real historical center. Window is oriented on the garden. Appartment is equipted with the very expensive technics. Very well decorated - with the good taste. Wifi is super perfect. Vieta, švara, personalas nuostabus charizmatiškas vaikinukas, kuris užsakė mums puikų flamenko šou netoliese, patokios lovos, rakinamas kiemas, liftas. Vaizdas pro langus (balkonėlius) į miesto sodą. Paukščių balsai. Net nežinau ar gali būti geriau. Dar ir automobilį pasistatėm nemokamai šalia miesto parko sodo, visai šalia. Puikus žavingas rajonas, šalia flamenko šou, mažytės senamiesčio krautuvėlės, restoranėliai su skaniausiu maistu. Rekomenduoju. Casa Sevilla Capital Centro is a holiday home situated in Seville in the Nervión district, 2.1 km from Plaza de España. Guests benefit from patio. Free WiFi is available throughout the property. There is a seating area and a kitchen. Average score from 10 guest reviews: 9.2/10. Alojamiento perfecto,en un entorno perfecto y con un trato perfecto por parte del propietario. La distribución de la casa. Un cuarto de baño completo por habitación la hace muy cómoda. Había buena conexión con buses al centro y al aeropuerto. La casa muy cómoda. La casa es muy confortable, amplia y dispone de todo lo necesario. Apartamento Sabina offers accommodation in Seville, 1 km from Plaza de España. The apartment is 1.5 km from Triana Bridge - Isabel II Bridge. Free WiFi is provided throughout the property. Average score from 31 guest reviews: 9.1/10. Our stay was perfect, excellent service from the owners!! We highly recomend this apartment. We stayed there for two whole weeks. Excelente ubicación, silencio para dormir y comidas de acceso. Prima appartement, best voor 2 personen of gezin met 1 kind. Locatie is prima, iets buiten het echte oude centrum maar op loopafstand. Alles netjes en schoon. Goede bedden en voldoende kastruimte om je kleding op te bergen. Goed functionerende WiFi in het hele appartement. Airco/verwarming in alle ruimtes. De gastheer Gonzalo was zeer hartelijk en flexibel en stond klaar om dingen te regelen indien nodig. Wij konden bijvoorbeeld al eerder inchecken en later het appartement verlaten was ook geen probleem. Situated 200 metres from Triana Bridge - Isabel II Bridge in Seville, this apartment features a terrace. The air-conditioned unit is 400 metres from Plaza de Armas. Free WiFi is offered . Average score from 31 guest reviews: 9.0/10. The roof terrace south west facing fantastic and there was a lift to the apartment so no slogging up the stairs. Everything was fantastic position, comfort, facilities. Location is great. The apartment is fun, with interesting decor. New, clean, wifi etc. Balcony is great. Fernando was really helpful. Quirky apartment in Sevilla. Good location, cafes and supermarkets nearby and bus to airport. Close to main attractions. Good air conditioning for 44 degree heat. Lovely terrace. Well equiped cooking facilities, washing machine& tumble dryer. Fernando met us within 10mins and provided information on where to eat and location of markets. Recommend the old fish market which is now a collection of food and drink stalls which is a 5min walk from the apartment and you can sit outside with views of the river. Also Taberna el Papelon at the end of the street for some tapas. 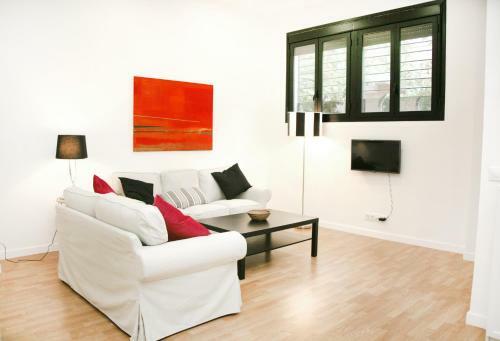 The flat is beautifully decorated, clean and located in the very centre of Seville. We thoroughly enjoyed our stay at this quirky apartment. Fernando met us at the apartment as promised to check in and gave us recommendations of where to eat etc. The location was excellent.....only 5 minute walk from the bus station and only 10 minutes into the centre of Seville. We particularly liked the private terrace and the air-con was excellent. I would highly recommend a stay at this apartment....it was amazing! Great location, could walk to everything. Large patio and apartment. Kitchen was well stocked; dishwasher and washer and dryer. Our host greeted us as promised and spent time explaining local sites and restaurants. The apartment's location is good and the terrace is very nice. El tamaño,los detalles,la decoración,...todo de luxe. 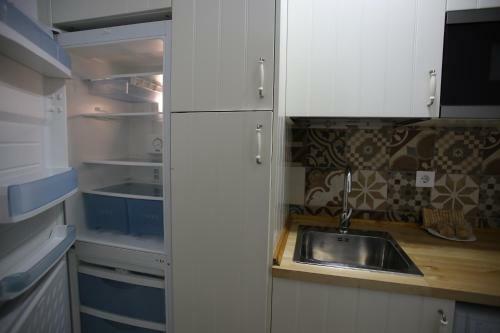 Situated in Seville, this air-conditioned apartment features free WiFi. 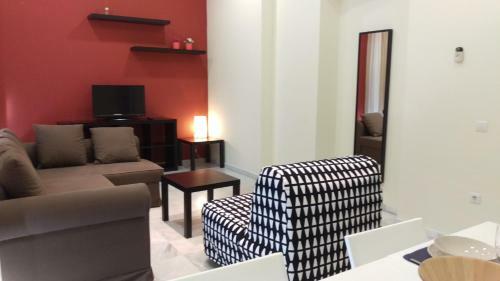 Apartamento La Feria boasts views of the city and is 1 km from Plaza de España. The kitchen comes with a dishwasher. A flat-screen TV with satellite channels is featured. Average score from 42 guest reviews: 8.9/10. La ubicación del piso, excelente! Las camas muy cómodas, y, en general, el piso muy acogedor! El dueño es una persona muy amable y flexible (para mí eso es muy importante). la situation sur une voie piétonne à proximité .des points d'intérêts à visiter;la climatisation nécessaire même en octobre! Nous avons apprécié l'accueil de Pedro, la possibilité de rester plus longtemps le jour du départ. 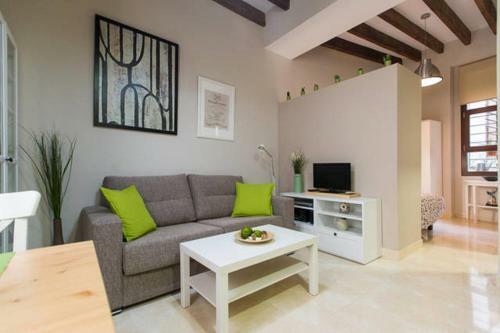 Apartment Santiago is an apartment set in Seville, 800 metres from Plaza Nueva. Guests benefit from balcony. Free WiFi is available throughout the property. The kitchen comes with a dishwasher and there is a private bathroom. Average score from 270 guest reviews: 8.4/10. Featuring free WiFi, Apartamentos San Bernardo offers accommodation in Seville. Plaza de España is 800 metres away. The accommodation is air conditioned and comes with a dining area and a seating area with a flat-screen TV. Average score from 27 guest reviews: 8.4/10. Lovely apartment with quality fixtures and fittings. Very clean and very comfortable beds!! We were talked through how everything worked and given a local map with numerous sights/restaurants/ bars to visit on recommendation. Great break away. Wonderful hosts! They made us feel really welcomed and gave us valuable tips about what to do in Valencia. Appartement très moderne, confortable et très propre (ce qui été notre critère principale). La literie neuve est très confortable et les équipements sont neufs. La localisation est idéale. Pas loin du centre et de la Plaza de Espagna. Le gérant ainsi que sa femme sont très agréables et parlent anglais. Ce qui n'est pas le cas partout dans cette ville. Je recommande cet appartement. moderne Wohnung (3 Bäder! ), perfekte Lage (nahe Zentrum und Bahnhof), nette und jederzeit erreichbare Vermieter - war alles super! Excelente en todos los aspectos. Muy buena situación. Atención exquisita. .Proximité de la ville avec option de parking gratuit .Propreté, confort .Acceuil et sympathie du propriétaire exemplaire. Located in Seville, Wonderful House offers self-catering accommodation with free WiFi. The property is 500 metres from Triana Bridge - Isabel II Bridge and boasts views of the river. There is a dining area and a kitchen. Average score from 11 guest reviews: 8.4/10. Situated 2.6 km from Plaza de España in Seville, this air-conditioned apartment features free WiFi and a terrace. The apartment is 3.4 km from Barrio Santa Cruz. The kitchen has a dishwasher and an oven, as well as a coffee machine. Average score from 843 guest reviews: 8.3/10. 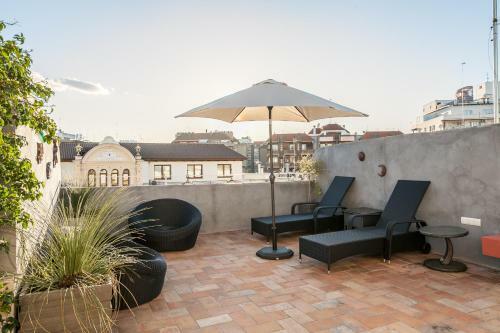 Set in Seville, this air-conditioned apartment features a terrace. The property features views of the city and is 100 metres from Plaza Nueva. Free WiFi is provided throughout the property. The kitchen has a dishwasher and an oven. Average score from 507 guest reviews: 8.1/10. Located 800 metres from Isla Mágica in Seville, this air-conditioned apartment features a balcony. The unit is 1.3 km from Plaza de Armas. The kitchen is equipped with a microwave, a fridge and a stovetop, as well as a coffee machine. Average score from 9 guest reviews: 8.0/10. Situated in Castilleja de la Cuesta, this air-conditioned holiday home features an outdoor pool. You can relax by the year-round outdoor pool in the garden in fair weather. Free private parking is available on site. Average score from 4 guest reviews: 7.7/10.